An Caisteal and Beinn a'Chroin are situated just over 1 mile south of Crianlarich village, 50 miles north of Glasgow, next to the A82 road. The image below is of the large car park for the hike to An Caisteal and Beinn a'Chroin next to the A82, just over 1 mile south of Crianlarich. This is a large car park that can hold many cars. The highest mountain in this image is 3,851ft Ben More north by Crianlarich. The image below is from the car park looking across a small field to the bridge under the railway line. Many hikers comment on this field being boggy. The mountain seen below is the 2,679ft Meall Dhmah. An Caisteal and Beinn a'Chroin are to the right in the image below. The image below is of An Caisteal Mountain by Crianlarich from the car park. The closest mountain is the 2,236ft Sron Gharbh with An Caisteal in the distance behind to the right. 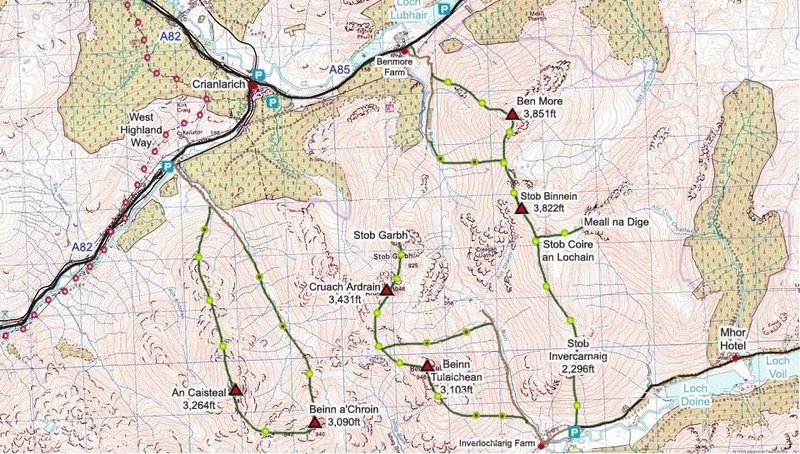 The Map below shows the main route onto An Caisteal and Beinn a'Chroin by going under the railway bridge, up the old farm road so far, over Sron Gharbh, on to An Caisteal, round to Beinn a'Chroin, then down off Beinn a'Chroin to the old farm road back to the car park.. The image below is of the Crianlarich Hotel from the railway viaduct, just over one mile north of the hiking car park. The hotel is ideally situated for hiking a number of Munro's. Beinglas Farm Campsite is situated about 5 miles south of the An Caisteal car park, and the Drovers Inn is situated a few hundred yards south of the Campsite. Beinglas Farm Map.